There is a newborn soft sprout. Is it growing up safely as a member of the nature after ten years? Even if metaphor environmental destruction continues, we have to convey this earth to our children who are successors. Nishikei, Inc. is performing production of an environment-friendly product which considered the ten-year back, in order to make the environment where many at least one sprouts will grow 10 or 20 years after, and children may protect the earth in which it can live with smile. Since it uses at an office, a school, and a home every day, I would like to use stationery in comfort. 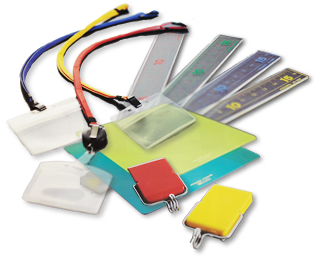 We are carrying out product development which considered the following, in order to meet your expectation. It is the style and design which are comfortable at any places, pursuit of a function which harnessed convenience, durability which bears also under severe environment and can be used for a long time, Furthermore, quality-of-the-material selection which is useful for the environmental preservation which was conscious of ecology. 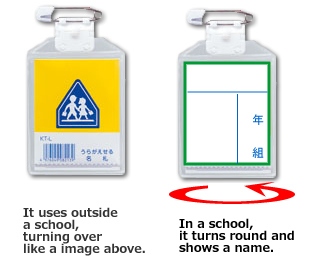 An attending-school child's name tag. Considering the safety control outside the school, it does not good for a child's safety ,that a child's name and school name will be seen by others. The name tag can be turned over by one-touch which have equipped clothes.